She just wanted to get a taste of what it was like in the morning before it would be corrupted by the movement of the day. After picking up her rental, which was much bigger than the car that she drove at home, she made her way out to Venice Beach–just for her taste. This particular February day was the warmest of her time out in LA; the sun had finally decided to assert its prominence high in the sky. It was the perfect time to stroll around near the Pacific Ocean and discover a new section of the City of Angels. The parking spot she found on the short street that dead-ended into the beach walk said, “one-hour parking only,” but after feeding the meter, it only allowed her 39 minutes. The machine simply stopped counting coins at 39 minutes. 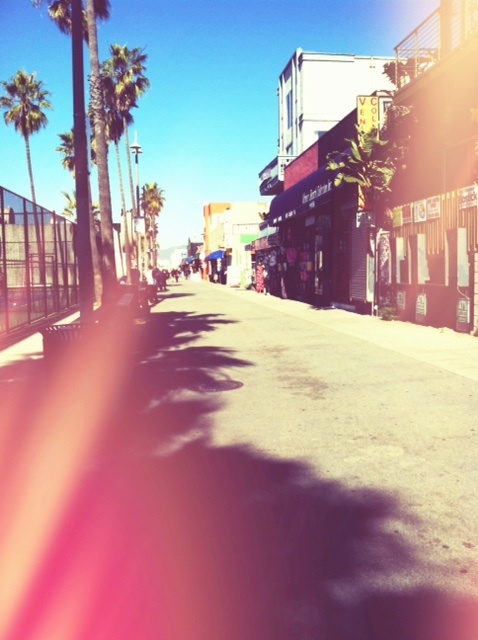 It was all the time that she would get to experience Venice Beach. At 10AM, the tee shirt and souvenir shops were just beginning to open up along the wide beach sidewalk. People speckled the area, but it was not the bustling scene that she had witnessed in the movies. She had expected more of a circus, a bigger show of sorts. But she also reveled in the fact that the beach was more peaceful, more “private” than what she had expected. An African American man wearing a very bright orange jacket and holding a clipboard approached her with a purpose in his gait. She could tell that he was promoting some cause and had targeted her as a potential donor or supporter. She was very well dressed compared to the few other people she had seen out and about; wearing black pants and a beaded red tank top, and perhaps this is why he hastened his step to greet her before she walked right by him. Though she was not in the mood for chat, she allowed his handshake and eager advances for the sake of the full experience. “Miss, I’d like to take a moment to ask for your assistance in providing Valentines meals for women with HIV and AIDS.” He said with deep concern. The man had a rasp to his voice that told her he had spent many years breathing through a cigarette in his mouth. “I’m sorry, but I don’t have any cash on me,” she told him, which was a lie. It was not that she didn’t care about the women suffering from AIDS, but she was down to about 35 minutes for her morning in Venice. She would make a note and remember to donate to a cause upon returning home. She could hear the waves crashing against the rocks that jettisoned just off the beach, and she wanted to be there by the water. Quickening her step to a slow jog, she made her way to the edge of the sand, careful to look both ways on the concrete path that paralled the beach. She was momentarily startled as two cyclists zoomed by her on their morning ride, leaving a trail of cool breeze in their wake. Directly in front of her was the Pacific Ocean, a beautiful body of deep blue mystery. Born and raised on the east coast, she had always dreamt of submerging herself in the waters of the Pacific. That would not happen today. The meter had only allowed her 39 minutes. The black boots she wore were not made for California sand trudging, so she snapped some photos and walked back behind the fence that separated the grassier park from the cool sand of the beach. It was always hard for a girl who was raised by the sea to leave the sight of it. Though this was not her home sea, standing near it made her feel safe. As she walked around the playground dotted with early rising toddlers and their mothers or nannies, she breathed in deeply and focused on her scene. Her full experience had to include all the sensual sights, sounds, and smells. She looked all around her and noticed large seagulls, bigger than she had ever seen on the east coast, perched on top of posts and on the ground around the park. She snapped a few photographs of these sights and reluctantly walked back to the big sidewalk with all the colorful bungalow shops. Catcalls rang out from a group of men standing nearby. One of them sent his Jack Russell mix after her. “That’s your prize, boy, go get it!” The man yelled after the dog. The girl smiled and offered a courtesy smile. She knew that there were many more “prizes” to be won for that little dog throughout the rest of the day. She continued along the path, breathing in the morning smells, which included a faint whiff of pot; the sound of hip-hop and reggaeton spilled from the tacky shops, just waking up. She made her way down the line of colorful awnings until something unique caught her eye. 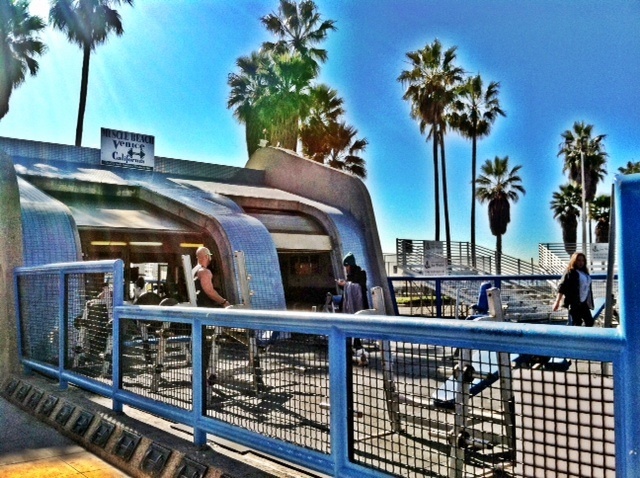 She stood for a moment in front of Muscle Beach to watch a few men bursting with strength warm up their bodies for their morning workouts. Muscle beach was not unlike the playground jungle gym with the kids that she had seen just minutes earlier, only this playground catered to adults on fitness kicks. A little further down the path, she came upon what looked like tennis courts, only the nets were lower and the rackets were smaller and padded. There was a foursome of men playing an animated game of miniature tennis. One of the men, who looked to be the youngest, was perfectly chiseled. His defined arms were covered from shoulder to elbow with tattoos. He wore tennis shoes with high socks and no shirt. The sweat glistened off his bulging chest muscles. She couldn’t help but stare. He flexed strong with every swing. She immediately felt like she was hunting this man, but all she wanted was a photo for the kill. Hiding behind a palm tree and garbage can, she quickly snapped a shot of her creature of fascination in mid swing. Proud of her accomplishment and the stealth nature of acquiring her photo prize, she continued down the sidewalk. Her metered time was running out. With only 15 minutes left for her taste, the girl decided that she would take some time to find a decent coffee shop for a quick caffeine fix before she hit the road north to Santa Monica. Her walk back towards the car was not without its own set of character encounters. A couple of teenage boys tossing a football made a big deal about their “cheerleader” who had arrived as she walked by. A disheveled man who walked with a purpose and spoke in incoherent fragments fussed about a flock of pigeons that had taken up a large part of the sidewalk. The girl also noticed shop owners emerging from their dark trinket-filled chambers to greet the locals as they made their obligatory morning rounds. The coffee shop she picked was just across the street from the tourist sidewalk area where she wandered around that morning. It was an independent, open-air cafe with fresh made pastries and a patio-style sitting area. The young woman behind the counter had wind-blown, long blonde hair that was tied-up in a messy bun and a fresh, young face. Two guys, ready to start the day out on the waves, came into the shop and knew exactly what they wanted. The visiting girl let them order first while she memorized this Southern California scene. The girl here for a taste wanted something delicious to complete her experience. She eventually ordered a large piece of coffee cake and an iced white chocolate coffee drink and took a seat at a small table next to the window. The cheerful fresh-faced girl bounced behind the counter as she prepared the drink. She placed the large sweet in a bag on the service counter for the visiting girl to collect. The sitting girl thought that the fresh-faced girl either had a life full of empty happiness, or the morning had yet to affect her mood for the day. After picking up her morning snack and leaving the cafe, the girl returned to the car where the meter read one minute remaining. She quickly dropped off her coffee and pastry and walked out to the tourist sidewalk once again; she wanted to say goodbye to the ocean. One more view was all that she needed to complete her time here. The ocean is always the most memorable scene. 39 minutes. All she had was 39 minutes in Venice Beach.